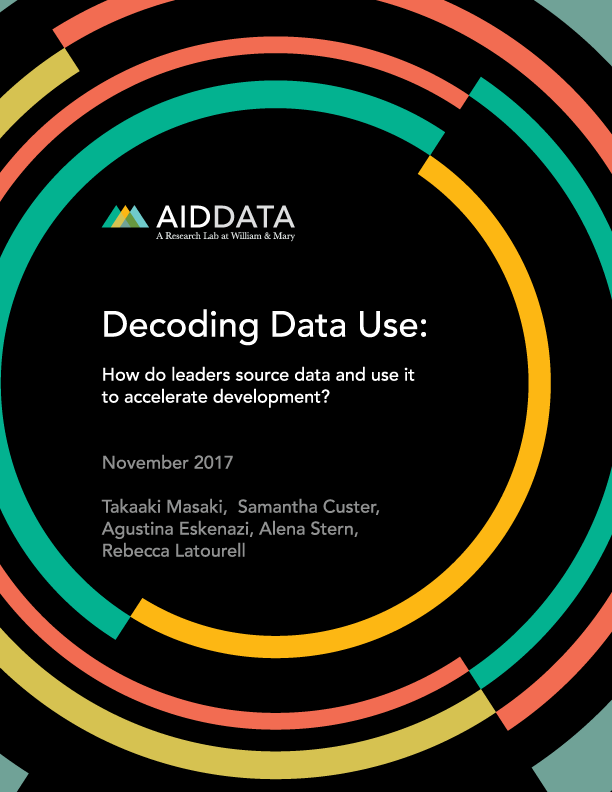 AidData | Decoding Data Use: How do leaders source data and use it to accelerate development? Masaki, T., Custer, S., Eskenazi, A., Stern, A., & Latourell, R. (2017). 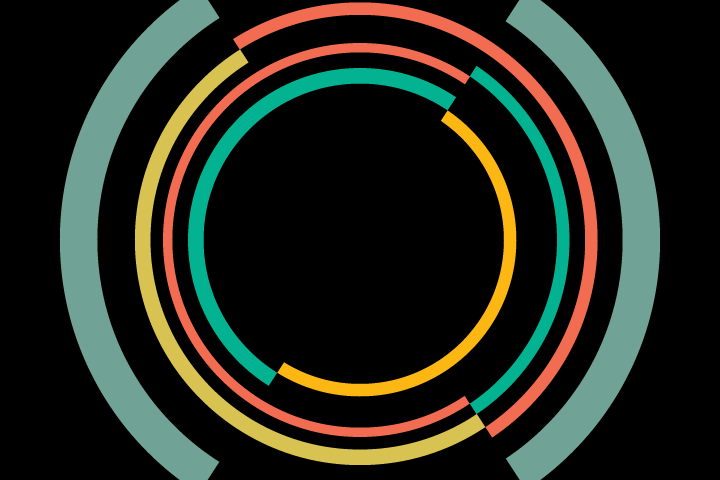 Decoding Data Use: How do leaders source data and use it to accelerate development? Williamsburg, VA: AidData at William & Mary. EVENT: On November 28, 2017, AidData's Director of Policy Analysis, Samantha Custer, joined experts from the World Bank's Independent Evaluation Group, the OECD, and Paris21 for an engaging panel discussion on enhancing the role of data in development. The event was livestreamed, and a recording is available. For a presentation of findings from this report, watch the video from 37:11 to 45:00 minutes at the World Bank's site. 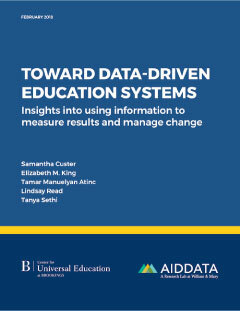 The Decoding Data Use report reveals what 3500 leaders have to say about the types of data or analysis they use, from what sources, and for which purposes in the context of their work. 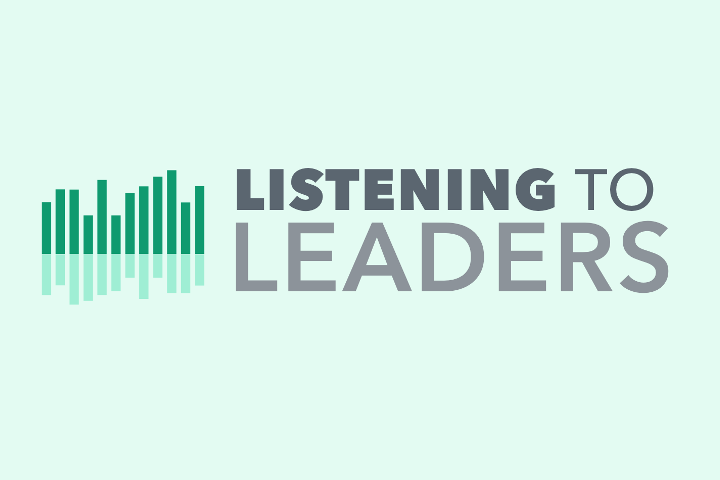 Our study draws upon responses to AidData’s 2017 Listening to Leaders Survey of public officials and development practitioners from 126 low- and middle-income countries (LICs and MICs). Armed with these insights, we help funders, producers, advocates, and infomediaries of development data understand how to position themselves for greater impact. Funding: This report was made possible through generous financial support received from: the Bill and Melinda Gates Foundation, Germany’s Federal Ministry for Economic Cooperation and Development, the United States Agency for International Development’s Global Development Lab (through cooperative agreement AID-OAA-A-12-00096), and the William and Flora Hewlett Foundation. Decoding Data Use: What evidence do world leaders want to achieve their goals? A new AidData report illuminates the black box of how leaders source evidence and use it to accelerate development in low- and middle-income countries. The survey will collect data from thousands of leaders on which development partners they prefer to work with, and why.